The town of Sherman is located in Grayson County. It was named for General Sidney Sherman (1805-1873) who during the battle of San Jacinto on April 21, 1836 is the person credited for shouting the battle cry “Remember the Alamo! Remember Goliad!” In 1846, the Texas legislature had created Grayson County out of Fannin County and designated Sherman as the new county seat. Sherman gained its first post office in 1847. It was fairly well established by 1850 and later became a stop on the Butterfield Overland Mail route. The town itself was initially located near the exact center of the county, but was eventually moved three miles east, to its present location. A Mr. T.J. Shannon began clearing the land with a team of oxen. Shannon’s 12-year-old daughter Julia was allowed to select the original street names, and she chose to use the names of Texas heroes and native trees, including Mulberry, Pecan, Elm, Walnut, Cherry, Crockett, Houston, Jones, Rusk, Lamar and Travis. Its namesake, General Sidney Sherman, was the son of Micah and Susanna Frost Sherman and was born in 1805 in Massachusetts. Both of his parents had died by the time he was twelve years old. He began supporting himself at an early age, working as a clerk in a Boston mercantile firm. Shortly thereafter, he relocated to New York City for a number of years, then moved to Cincinnati, Ohio, finally settling in Newport, Kentucky just across the river from Cincinnati. There he established a company that bagged cotton bales with machinery and also set up a company that made lead sheeting. In 1835, he was known to have become a captain in the Kentucky Militia and sold his cotton bagging plant using the funds to equip a company of 52 volunteers, organized to join the Texas Revolution. The group left Kentucky by steamer in late 1835, arriving to join Sam Houston shortly after the fall of the Alamo. From that time on, they were active in the revolutionary effort. Sherman was commissioned in the Texas Army at San Felipe and began serving as a Lt. Colonel under Col. Ed Burleson, both of them reporting to Houston. Sherman was later given command of the Second Regiment of Texas Volunteers. He served in that capacity during the “Runaway Scrape” in which the army and civilians retreated from Santa Anna’s forces for a time before forming to confront the Mexican Army at San Jacinto. Sherman actively participated in the battle of San Jacinto. In the television miniseries “Texas Rising” he was portrayed as having prematurely engaged the Mexican Army on the eve of the battle, contrary to Sam Houston’s orders. 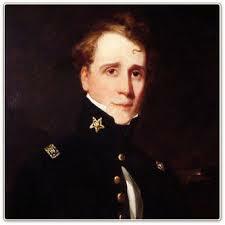 He reportedly left the Texas camp with a small detachment of cavalry, almost bringing on the general battle. In the clash, two Texans were wounded, one of whom died, and several horses were killed. Private Mirabeau B. Lamar distinguished himself in the battle, coming to the notice of Houston. Lamar, who would later be elected President of the Republic, is said to have saved the life of Thomas Rusk for which he received a field promotion to Colonel. Sherman was removed from command. To the best of our knowledge, the account in the miniseries is generally correct, though it is unknown what long term impact, if any, the skirmish had on Sherman’s later career. There were many individuals who disagreed with Houston and his leadership, so it may have had little impact at all. Following the success of the of the Texans in the battle of San Jacinto, Sherman offered his resignation, but interim President of the Republic David G. Burnet refused to accept it, instead asking Sherman to return to Kentucky to recruit more forces, which he did. Upon his return, he and his wife settled near the San Jacinto battleground. He became a representative from Harris County to the 7th Texas Congress, serving as chair of the committee on military affairs. After Texas was annexed in 1845 by the United States, Sherman continued in business in Harris County, establishing a railway company. The Buffalo Bayou, Brazos and Colorado Railway was the first railroad in the state and the original unit of the Southern Pacific System in Texas. Sherman initially experienced some success along with considerable misfortune in business, including a devastating fire that ruined his sawmill. His home also burned, as did the railway office. After the State of Texas voted for succession and joined the Confederacy in the Civil War , Sherman continued to serve in the Texas military, serving as commandant of Galveston during the siege of the city. He lost his son, Lt. Sidney Sherman in the Battle of Galveston. His only other son, David Burnet Sherman died after the the rest of his family had relocated to Kentucky. His wife died in Kentucky in 1865 and was buried in Galveston. Sherman spent his last years in Galveston living with a daughter until he died in 1873. He was first buried alongside his wife, but in 1894 he was re-interred in Lake View Cemetery in Galveston, next to his friend David Burnet under a monument dedicated to both men for their service to the Republic. Sherman was honored during his lifetime by the naming of the town of Sherman and was also similarly honored by the naming of Sherman County, located at the top of the Panhandle, its northern border adjoining Oklahoma. By 1850, the town of Sherman had been incorporated and within a couple of years had a population of about 300. It continued to expand and develop during the next two decades. The Sherman Male and Female High School began taking on students in the 1860s under the patronage of the North Texas Methodist Conference. It transitioned into a college that operated until around the time Southern Methodist University became more firmly established around 1935 in nearby Dallas. Austin College relocated to the area from Huntsville and remains there today. There were numerous other colleges in the area from time to time. 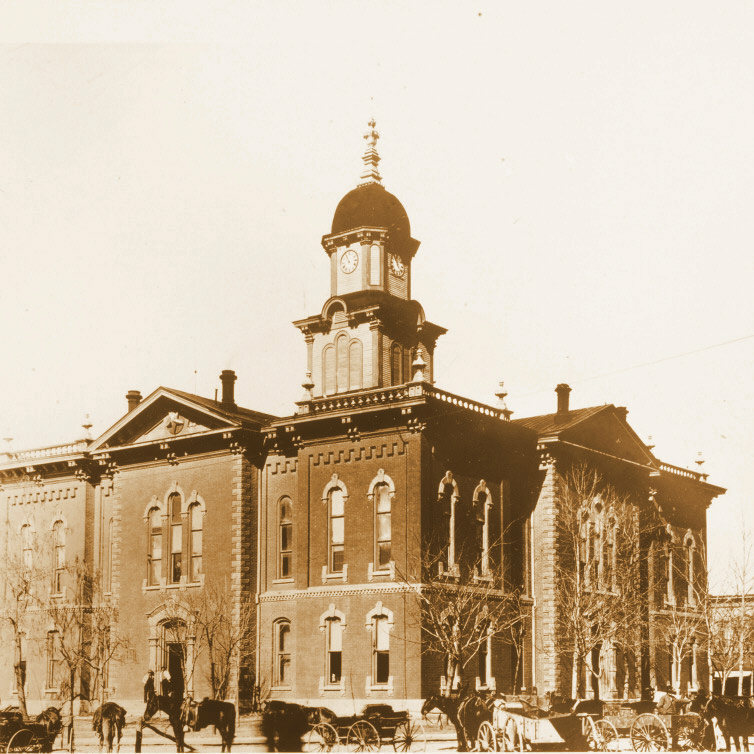 Above image: the Grayson County Courthouse, destroyed by fire in a 1930 riot. Sherman continued to grow, reaching a population of about 6,000 by the 1870s, somewhat similar to that of Dallas at the time. In the 1890s, the town was severely damaged by a massive tornado, cutting a swath through the town and killing about 75 people. In 1901, the Interurban rail line was established, the first electric railway in Texas. Initially it connected Sherman and Denison with Dallas but eventually was extended all the way to Waco and Corsicana to the south and laterally to Terrill and Fort Worth providing inexpensive transportation between these cities until the late 1940s. Through the years, Sherman’s population has continued to increase, topping 10,000 in about 1900, 20,000 around 1950 and had reached 35,000 by about 2000. Didn’t have any idea that Shannon’s 12-year-old daughter Julia was allowed to select the original street names. That is a terrific piece of history! That is amazing that the 12 year old daughter was allowed to choose the street names. Nor did I know that the General was born in Massachusetts. Thank you for adding these pieces of history!